It is not unusual to see a little path disappear into the brush along the rural roads in Alaska that might lead to a person or even a family living “off the grid”, having no electricity or running water and heating with wood. It’s also not unusual for someone to pull off the road and blast a few rounds off into the brush just to let off a little steam. Actually, sometimes they don’t even stop but just shoot out the window of a moving vehicle, of course, only when they believe the State Troopers aren’t around. 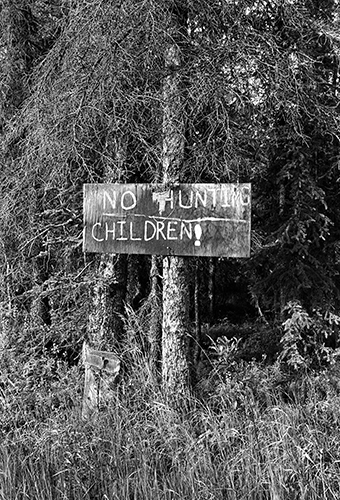 Apparently, there was someone with children at the end of this path as this was an actual sign along the Richardson Hwy in Alaska that I couldn’t pass up. I thought of the double meaning of the title before the shutter even clicked. I made this image with a Leica M6 camera on Ilford black and white film.